This blog post is dedicated to all the contact lenses users. Sight is one of the most important senses so in order to maintain good and healthy eyesight, eye care is very important. 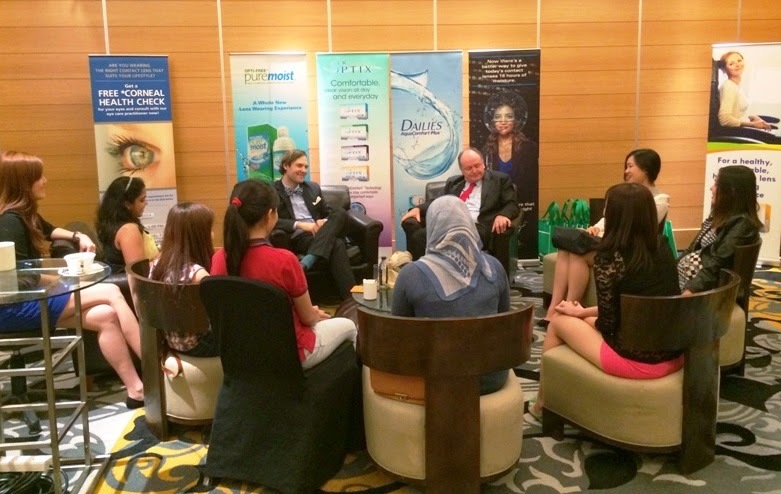 This sharing session with Dr. David Kading and Dr. Timothy Grant is about the contact lens awareness session highlight something that many of us now use on an almost-daily basis, so much so, that we sometimes forget the importance of practicing the simple, good and safe steps to keep our eyes healthy. • Cosmetic contact lenses are safe if they are obtained from prescription given by your eye doctor/optometrists. • Advancement in technology in the contact lenses industry brought about plenty of choices for safe and comfortable cosmetic contact lenses. There are plenty of contact lenses in the market such as daily contact lenses which can be disposed of after a day, monthly, 3 months and so on. • Purchasing cosmetic contact lenses off the shelf, online or at the night market / pasar malam can be potentially dangerous and harmful, as we do not know where these contact lenses came from as they are not prescribed by someone with qualification, it may not fit the eye properly, and there may be long term effect that may damage the eye. Interesting Fact: Do you know that different people have different shapes of the eye? Your eye doctor / optometrists are able to prescribe the best contact lens for your eye according to the shape of the eye as it might differ from that of your sister or your friend… one size definitely does not that fit all. Why does my eye dry up after certain period of wearing contact lenses? Do eye drop help dry eyes? • Dry eye may take place when the contact lenses that the person wears are beyond the advised period or are not properly moisturized. • It is important that people use the correct contact lens solution that is prescribed by eye doctor/optometrists as the contact lenses need to have the correct contact lens solution for it to be fully moisturized before it is ready for wear. • Eye drop can be used throughout the day, but if the contact lenses were moisturized properly with the prescribed contact lens solutions, it can minimize discomfort and dry eye. • Also, everyone has different lifestyle and most of the time; people wear contact lenses and look at their computers / smartphones / tablets throughout the day that they forget to BLINK. • Blinking is very important to avoid dry eye. The proper way of blinking is for the upper eye lid to touch the lower eye lid. Most of the time, people only blink and did not realise that they are blinking half way (upper and lower eye lid did not touch). Contact lens solutions are available in the market and there are many different brands with different functions, how do I know which is the best for me? • Your eye doctor/optometrists will prescribe contact lens solutions that are best for you and your contact lens. • Using different contact lens solutions apart from those prescribed by your eye doctor/optometrists may not give you the best result/comfort level when you are using your contact lenses. There are many types of contact lenses in the market, how do we know which one suits our eyes best? • Visit your nearest eye doctor/optometrist for a full eye examination. • Follow the prescription given by your eye doctor/optometrist to purchase the most suitable contact lens and contact lens solutions for you. • Do not purchase contact lenses off the shelf, online or at night market / pasar malam. Always go to an eye doctor or optometrists for eye examination before a prescription is attained. Is it safe to share my contact lenses with my sister(s)/friends? • No. It is not safe to share contact lenses as well as contact lens case. • Every individual has different shape of the eye vision power. Your eye may be of different size to your sister/friend. Wearing contact lenses that do not suit your eye will cause discomfort and may damage the eye in the long run. • Also there is the hygiene issue. Something as important as the contact lenses, should not be shared. • Wash and dry your hands before handling contact lenses. • Proper and regular cleaning of contact lenses is a must. Usage of the right contact lens solution prescribed by your eye doctor is important to keep the contact lenses clean and safe. • Contact lens storage case should be replaced regularly. Clean the contact lens case after each use. • Contact lens solutions to clean and disinfect your contact lenses should be prescribed by your eye doctor/optometrist. • Do not recycle contact lens solutions. Use only fresh contact lens solutions prescribed by your eye doctor / optometrist to clean and store contact lenses. • Visit your eye doctor / optometrist regularly for eye examination and new contact lens prescription. Do not make compromises to purchase cheap contact lenses off the shelf / online / night market / pasar malam as we may not know what are the long term effect it will have on our eyes/vision. I believe choosing the right and best contact lens for the eye starts from the optometrists and opticians making the recommendation that is best for the contact lens wearer. Our eye sights / visions are so important that I believe majority of us will never trade this sense for the others. You may not have any problems right now with your vision but you do not want to wait until the problem starts, then only you go to an eye doctor/optometrist to seek help. Let your eye doctor/optometrists help you through the process, likewise there are many eye diseases out there. There are some eye diseases that can be caught or detected early. If you wait for the symptoms are there or persist, it can severely cause damage to your eye for the rest of your life. It can be managed / detected by a visit to the eye doctor regularly such as every 6 months. Thanks for the info. I am a user. plus the newest style with some pattern inside the lens like hello kitty makes everyone soo attacked with it..thanks for the info! !